A few years ago I was fortunate enough to have a box of glass slides come into my possession, here are a few of them, one day I’ll get the whole lot scanned in and shared. 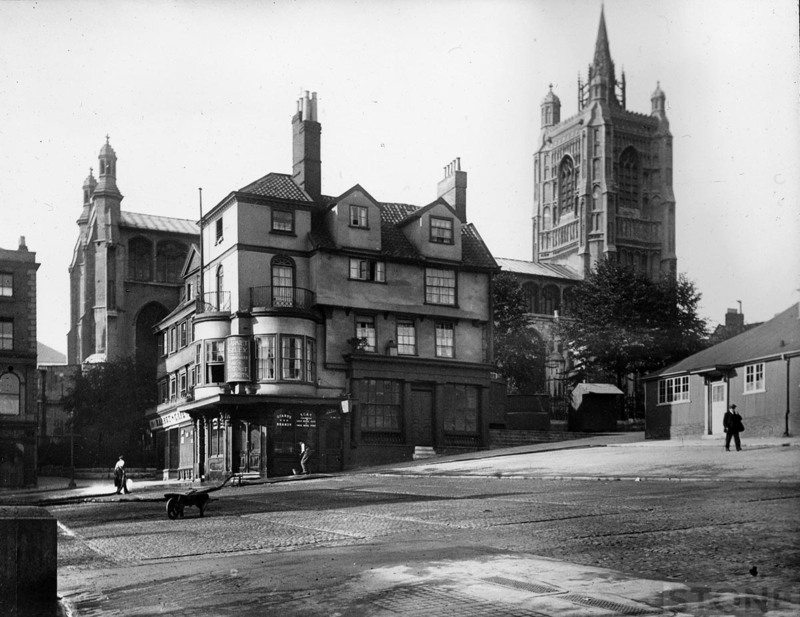 But for now here are a selection of Norwich through the glass from about 1890 to 1920. I suspect some if not all of these are by George Swain Senior. Looking South towards St John Sepulchre if I’m not very much mistaken, very poor area pretty much forever. Note truck, milk cart and motorbike. Again I’m thinking Early 20th Century, maybe about 1910, The tin shed on the right was an annex to the police station and later the maternity building I believe. Not the buildings next to the Garnet that aren’t there any more which lined the market side weren’t there then either. Possibly my favourite plate out this batch. Bit narrower. not a soul to be seen. 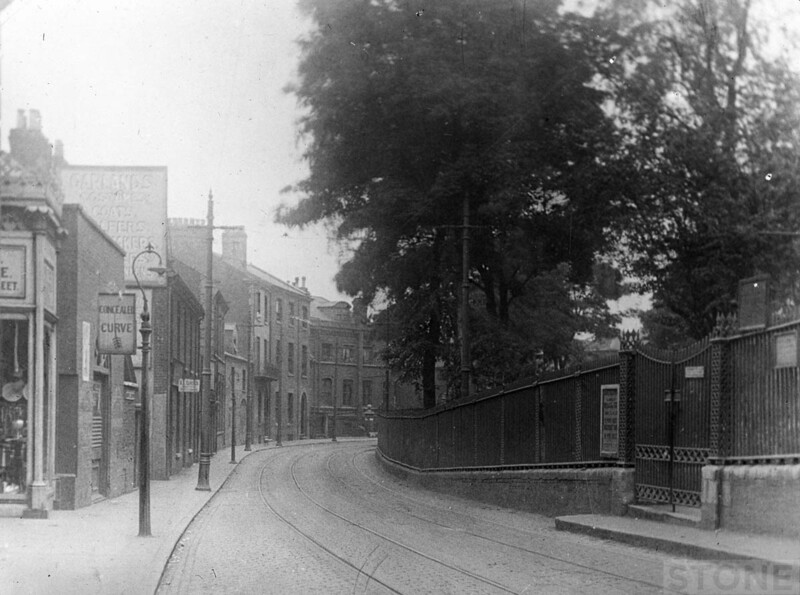 Tram lines give away the age, we did work out where this is fairly exactly, looks to be the top of the steps from Davey Place looking towards the top of Prince of Wales Road probably 1900. Clothes look pre Great War or thereabouts, so it would seem. Plus it’s got Trams, lovely trams in their terminus. 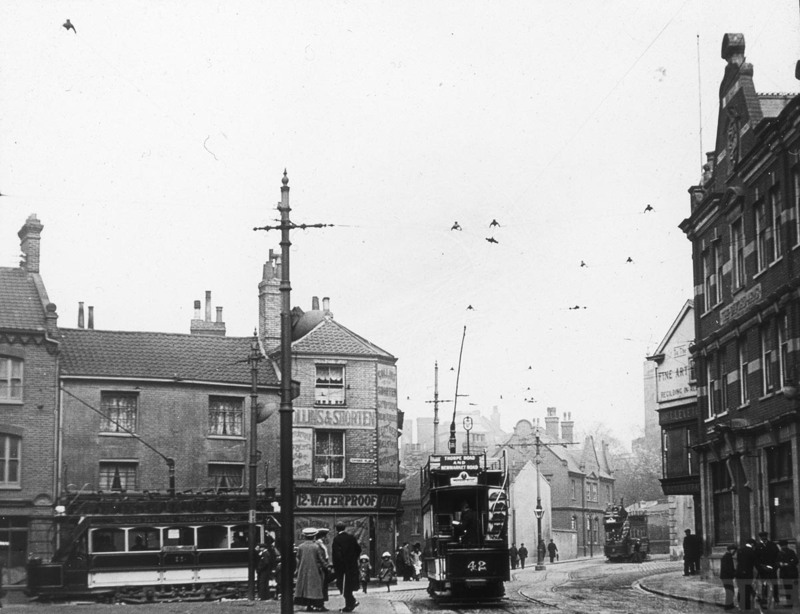 Note that Red Lion Street joins Castle Meadow as it does now, it didn’t originally, opened up by removing buildings so trams could get through to Castle Meadow and Prince of Wales Road. 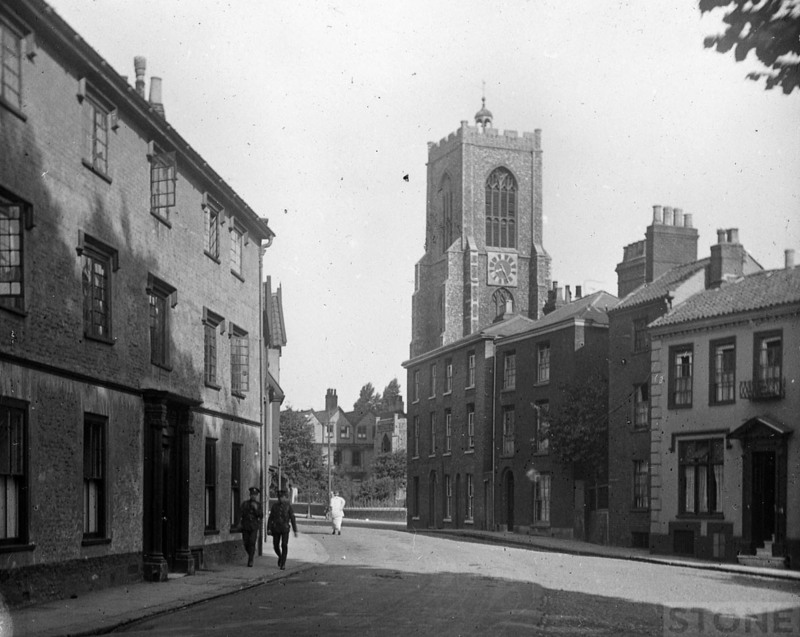 You can just see the Castle peering round the corner of The Bell Hotel, I’ve done that too, it was a dangerous place in 1987. Viewed from Bethel Street. I’d guess at early WW1 based on the stiff peaked caps, although that doesn’t follow that it’s later, it does imply that these lads were dressed properly though as the stiffener is still in, a fashion that was more common with those who weren’t at the front who tended to take the stiffener out. They also have the long Puttees and the woman is showing her ankles which is a bit riske. Difficult to say exactly. Just before the turn of the century one would make the assumption. 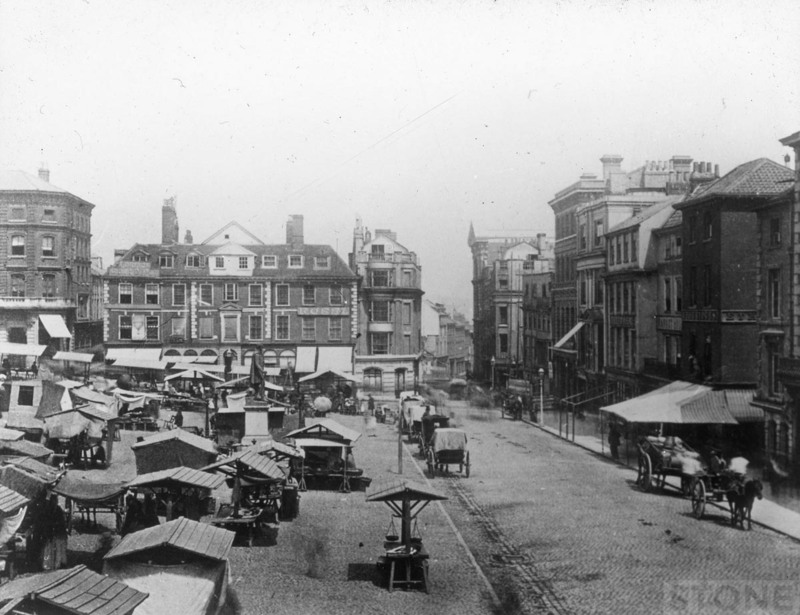 Wellington is on his pediment, Transport is feet and horse with no sign of tramlines yet, which appeared around 1900 and Jarrolds is not in it’s Skipper home yet which was around 1905 – 1910. So it’s an old one, at least the scanner coped with it. It could have been shot from the row of buildings that was Bookmart. Fantastic photos. Do you have any of St Stephen’s road? 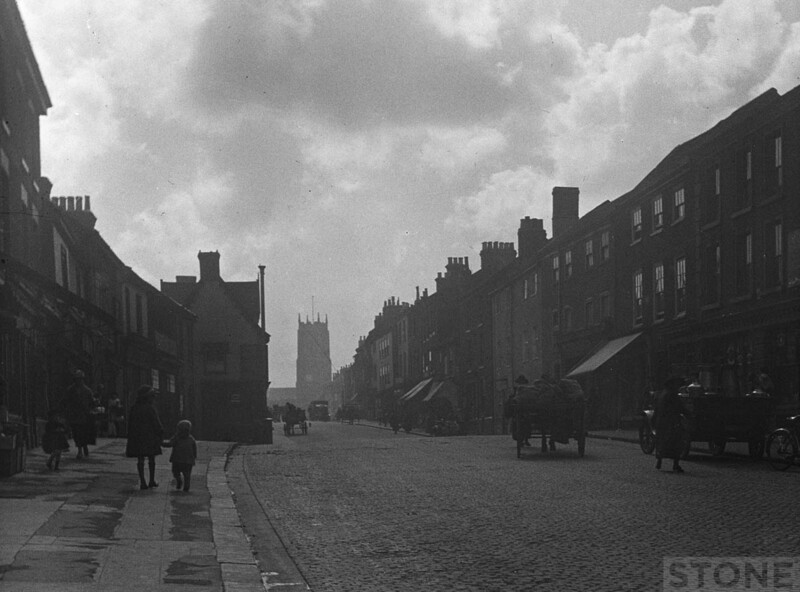 Live opposite the old hospital and have yet to find any early views of this side of street. There are a few views of St Stephens Road, mainly postcards, and mainly looking up towards the split between the Ipswich Road and the Newmarket Road, but you never know what might turn up. Another set of captures which have whisked me away to another time and place. I did wonder if the gents in uniform could have been City Police men, but the webbing pouches probably indicate that they aren’t. The Garnet shot has a gent dragging what looks like a water hose behind him. Possibly washing down the road or settling the dust? Nice wheelbarrow too.